Happy Thanksgiving to you. Enjoy! Cone wreaths are making a come back. This was my first attempt and it was fairly easy to make. Cut several 6" & 4" squares out a coordinating DSP. Fold each square into a cone shape, hot glue them to stay closed, arrange them on a circle cardboard and hot glue them down. Decorate the middle however you like. I stamped DECK THE HALLS on a piece of DSP and glued it to another piece of cardboard. Add a ribbon hanger. ENJOY! 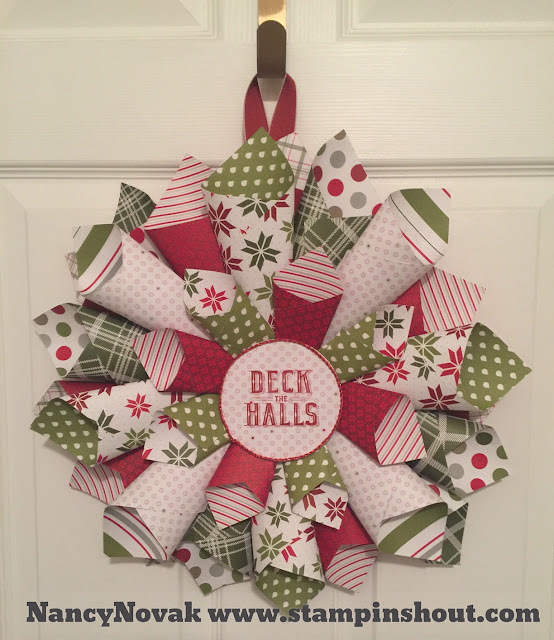 Do you want to try making cards & papercrafts like this wreath? Come to one of my classes....all the supplies are included. Email me at www.stampinshout.com for more info. We’re entering the “most wonderful time of the year,” and not just because of the holidays. 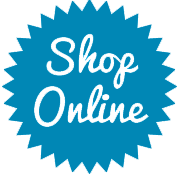 It’s Online Extravaganza. 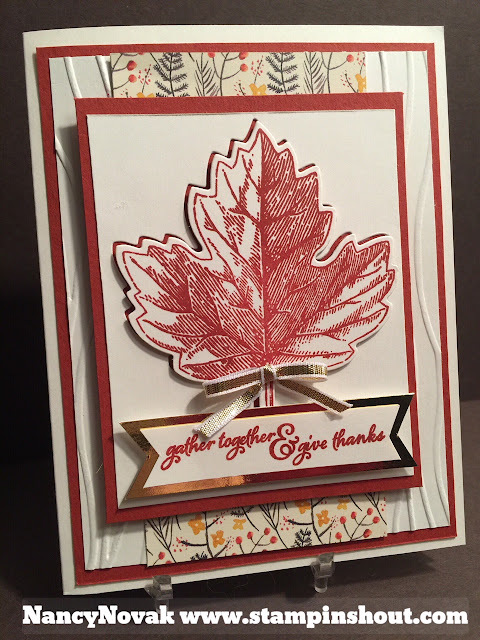 Exclusive deals and incredible sales On Stampin' Up! 's great products available for limited times. The first incredible offer is the 24-hour stamp sale. Select stamp sets will be 20% off for the first 24 hours of Online Extravaganza. Today's card is perfect to send to anybody you want to feel special during this season of thanks. Vintage Leaves on Painted Harvest. ENJOY! You can make this card. Card Making classes weekly in the Livonia/Canton, MI area. Email me for details. $5 includes everything plus fun.